Do you prefer being seen by the same provider each time you visit the dental office? Well, Dr. Helton, Amy, Kathy, Cindy, Carrie, Kristin and Emily have a total of 104 years of service to our patients at this practice! So relax, you can be assured of the same friendly provider each time we see you! 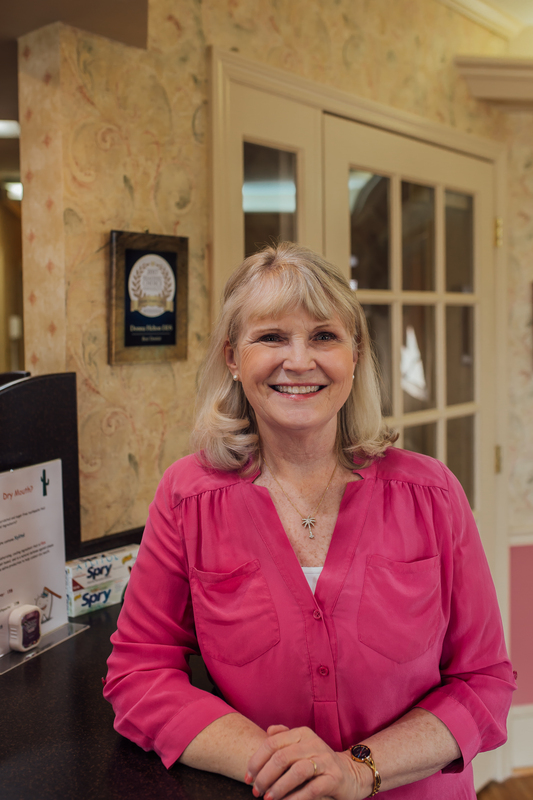 Dr. Helton has practiced family and cosmetic dentistry in Danville since 1983. She is a graduate of the University of North Carolina at Chapel Hill with a BA degree in Chemistry and a Doctor of Dental Surgery. Dr. Helton prides herself on compassionate comprehensive care for the entire family. She values the relationships that she builds through her family of patients. 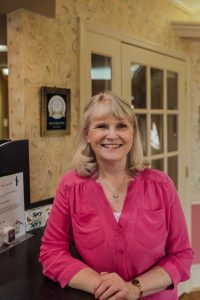 She is long time member of the American Dental Association, the Virginia Dental Association, the Danville-Pittsylvania County Dental Society, The Academy of General Dentistry, The Christian Medical-Dental Association (CMDA) and the Academy of Laser Dentistry. Continuing education is very important to her in order to stay abreast of the latest materials and techniques in dentistry, thus bringing those benefits to her patients. In addition to dentistry, Dr. Helton is very involved with her family. Her husband, David, is a pharmacist and they have two children, Michelle and Cliff. Michelle is married (September 2017) and lives in Virginia Beach and works as a Social Worker. Cliff graduated Caldwell Academy in May 2018 and is currently at Samford University, in Alabama. Dr. Helton is an active member of West Main Baptist Church where she works with the missions team. As a member of CMDA, she has done two dental missions in Nicaragua as well as several mission trips in the Caribbean. 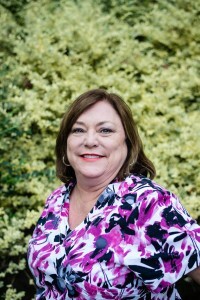 As a cancer survivor, she and her staff support the Danville Cancer Association through the Bridge to Bridge run/walk, the American Cancer Society’s Relay for Life and the Lingeberger Comprehensive Cancer Center. Complete oral cancer exams are very important to her practice of dentistry. She always welcomes new patients to the office who like the compassionate, caring environment that her team offers. 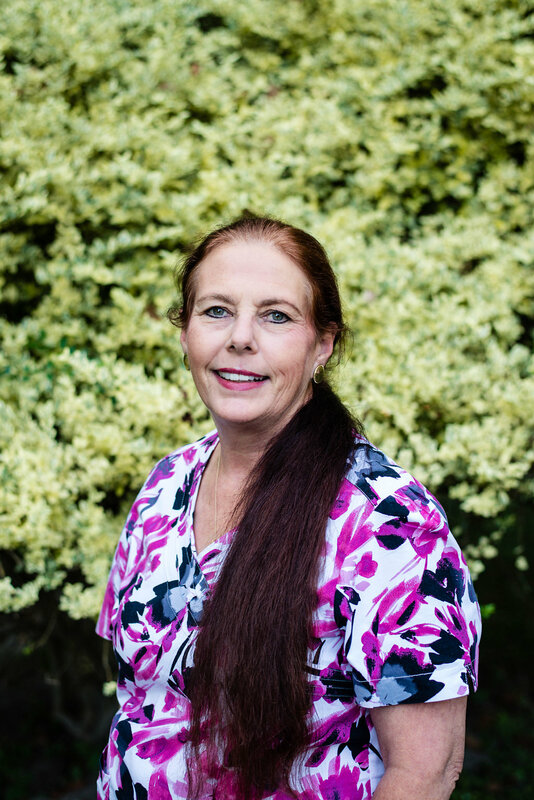 Cindy has been practicing Dental Hygiene in the Danville area for 37 years. She is committed to providing excellent gentle dental care to our patients. Cindy believes in the strong connection between a healthy mouth and a healthy body. When not working Cindy enjoys her family: husband Jr., sons, Alex, wife Erin and Drew, Cocker Spaniels, Colby and Reagan. Cindy is a member of the Danville Master Gardeners, has training in Reiki and Hypnosis. In her spare time she enjoys making Chrismons. Amy has been working with Dr. Helton in various administrative and clinical capacities since the Spring of 1997. Her primary responsibilities involve coordinating patient care that best meets our patients dental needs. 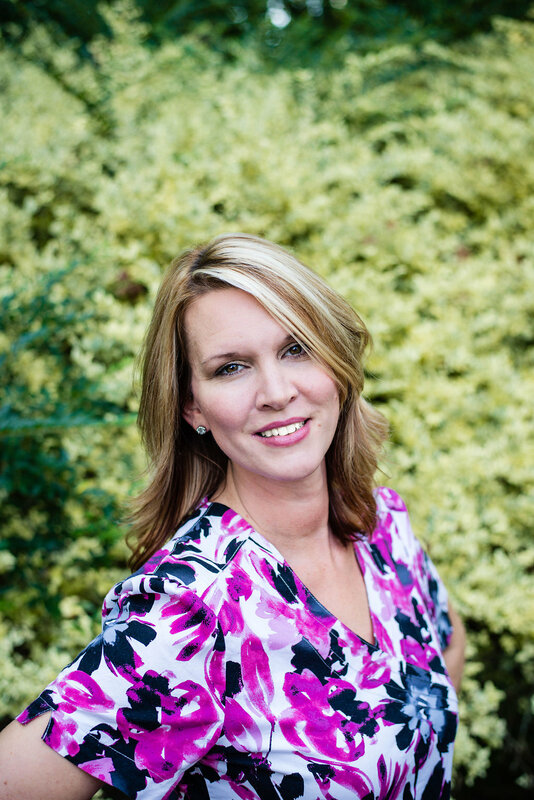 Amy is a graduate of Averett College with a Bachelor of Science degree in accounting. 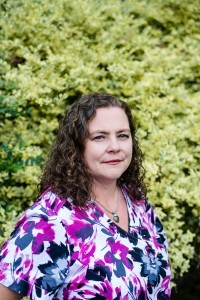 Amy was married to Paul in September 2018. She has 3 wonderful stepchildren and 3 step grandchildren. Her and Paul have two dogs, Scooter and Sophie. Kathy handles any questions you may have concerning insurance filling, billing and financial arrangements. 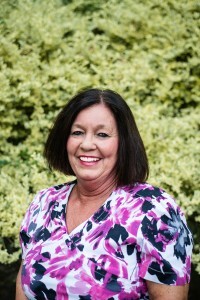 Kathy has worked with Dr. Helton since Spring 2000. She enjoys helping patients achieve their dental goals. She shares in our patients enthusiasm when they accomplish their new smile. 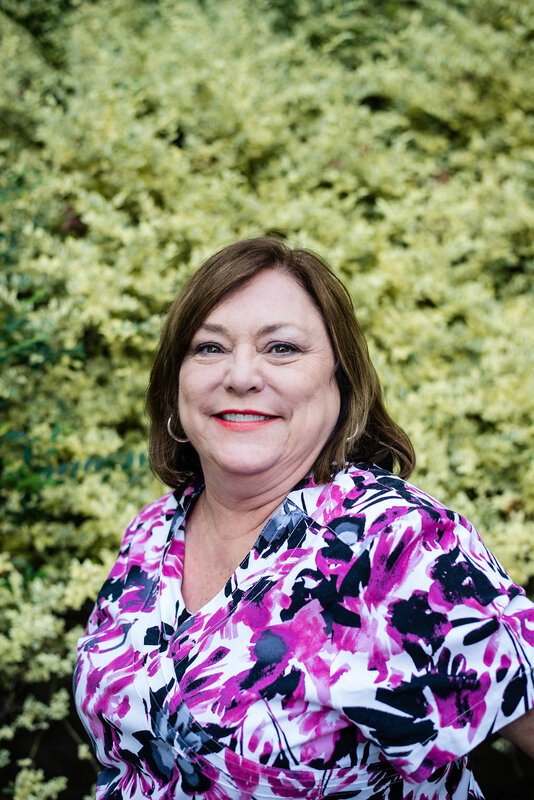 Kathy enjoys spending time with her grandchildren, going the their baseball games and going to antique auctions in her spare time. 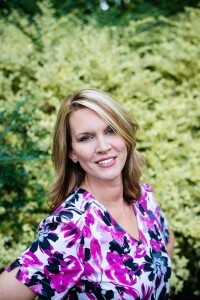 Carrie joined Dr. Helton’s dental team in 2006. Dental hygiene is a second career for Carrie and she finds her work to be extremely gratifying. Carrie enjoys running and hiking on the local mountain bike trails. She also volunteers with the Danville Master Gardener’s Association. Carrie and her husband Mike have two sons and a daughter-in-law, and two dogs Ronin and Riley. Kristin joined Dr. Helton’s in August of 2014. She is a graduate of the Dental Assisting program at Danville Community College. She is a member of the American Dental Assistant Association and is Nationally Board Certified in radiation and infection control. She takes pride in her work and really enjoys being a part of the amazing team at Dr. Helton’s office. She spends her free time spreading awareness about Childhood Cancer, volunteering in Waumba Land at New Life Community Church and exploring the great outdoors with her family. She and her husband Shannon have three children, Corey, Ariana and Nathan. Emily joined the team at Dr. Helton’s in May 2018. She graduated from the Dental Assisting program at Danville Community Collegeand is nationally Board Certified in radiation and anatomy. She enjoys spending time with her famly. She is the oldest of three, she has a younger brother and sister. She enjoys traveling and being outdoors.